Our planning committee, including Fashion design students from Sanford-Brown College, visited The Children’s Shelter today to meet the kids and understand the full impact of our donation on the charity. Pictured: Christina, Rosangelica, Elise, Kalliope Kids Co-Founder Nicole Campbell, Grace, Ayanna, & PR Director Anais Biera Miracle of The Children’s Shelter. 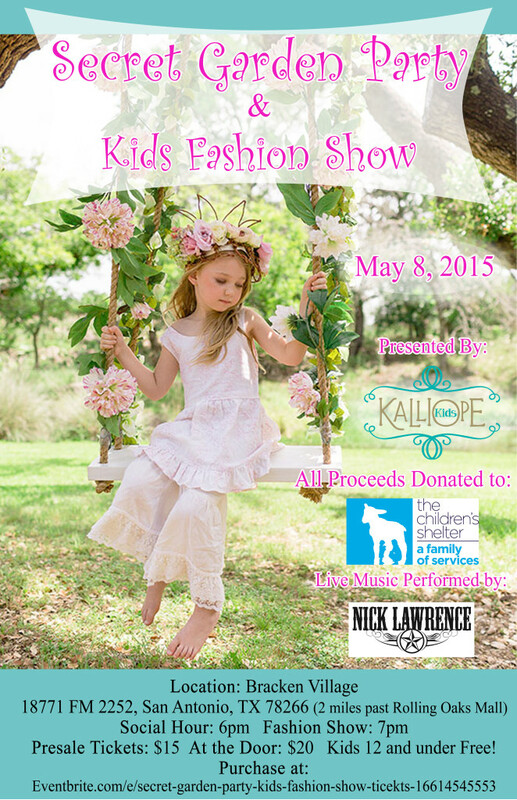 San Antonio, Texas (April 30, 2015)—On May 8, 2015 Kalliope Kids, Inc., a national kids clothing brand, will host the “Secret Garden Party & Kids Fashion Show” at the gazebo in Bracken Village, 18771 FM 2252, San Antonio, TX 78266. 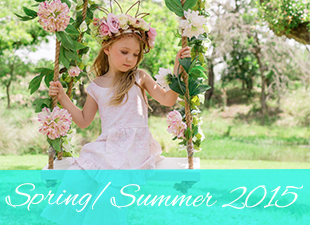 The fashion show will debut the Kalliope Kids Spring/Summer 2015 collection, available in stores & online now. All proceeds will benefit The Children’s Shelter and the show will spotlight local children who have overcome various hurdles in their lives – from cancer survivors to adoption success stories – in order to raise awareness for community charities. Kids under 12 get in free, and adult tickets can be purchased prior to the show on eventbrite.com for $15 or at the door for $20. 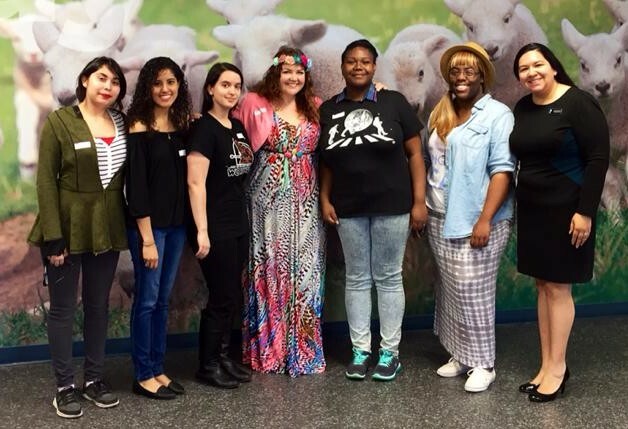 By recruiting volunteers from Sanford-Brown College’s Fashion Program, Kalliope has compiled a team to assist them in hosting the show and in exchange provides hands-on experience for the future fashion designers of San Antonio, TX. 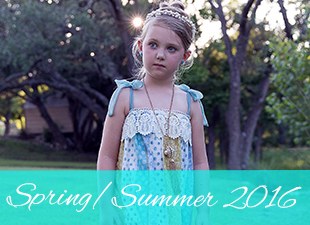 “We create unique, vintage-inspired clothing for the modern child encouraging children to march to their own beat & express their developing personalities through fashion,” said Nicole Campbell, Co-Founder of Kalliope Kids. Food provided by Avocado Cafe, face painting, cotton candy and live music by local artist Nick Lawrence Band will make this event fun for the whole family. Items in the fashion show will be available for immediate purchase on-site. Attendees will have the opportunity to sponsor a child by making a monetary contribution, which will benefit the children residing at The Children’s Shelter. To complete the spring “Secret Garden” theme, they encourage party-goers to dress in festive sundresses and headwear. Door prizes given away the night of the fashion show include: Best Dressed Child, Best Dressed Adult, and Best Headwear. “The Children’s Shelter serves over 4,000 vulnerable children and families every year. We rely heavily on our community to help provide much needed in-kind donations, such as clothing and shoes for our children who reside at our emergency shelter and residential treatment center,” states Anais Miracle, Vice President of External Affairs at The Children’s Shelter. 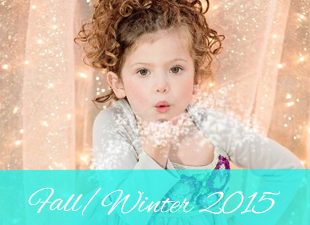 Kalliope Kids strives to actively support local charities and have participated in the Catwalk for Hope Fashion shows benefitting The American Cancer Society since 2012, as well as the Ebony and Rose Gala supporting the Frieda Fighting for a Chance Foundation in November 2014. The Children’s Shelter has supported children of the San Antonio and Bexar Country area since 1901 and strives to strengthen families and restore innocence to children. “Teaching the next generation to be thoughtful, generous and to help others is why charity work is so important to us. Charity is about improving people’s lives, which brings joy to us and those we help,” according to Jennifer Jones, Designer & Co-Founder of Kalliope Kids. Best friends since high school, the Kalliope Kids founders Nicole Campbell and Jennifer Jones strive to promote education, ethical behavior & goodness within the fashion industry. After years of working in the industry for other companies, the two decided they wanted to combine their talents to create garments for children that considered quality and age appropriateness but remained fun and unique. Founded in 2012, their first collection was released for Fall/Winter 2013. In the near future, the duo intends to continue involvement in local & national charities, bring more fashion related jobs to San Antonio, as well as styling celebrities such as the Hype Girlz, an emerging pop group of girls with an anti-bullying message.